← Do Rural and Urban Scotland need each other? 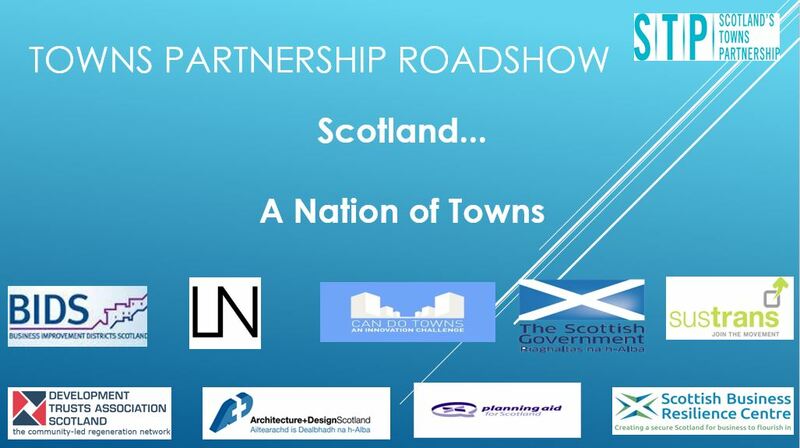 In retrospect it was a shame that the first Scotland’s Towns Partnership Roadshow was held in Galashiels earlier this week. Not of course, because it was Galashiels, but rather because the re-opening of the Borders Railway is still a few weeks away. An STP day out in the Borders by train sounds fun; perhaps another time? (as a total aside it is going to be interesting to see the impact of the re-opening – there certainly is currently a huge ‘buzz’ about it, and it will connect towns in a different way). There were a couple of purposes of taking STP on the road – and the Gala event was the first of a sequence in the coming months. First, we are still looking for feedback and engagement on the Understanding Scottish Places tool and the roadshow allowed us to present the USP platform and to get people to use it there and then, and then to reflect on what we might attempt to include in version 2. Secondly, there has been a recurring sense as STP has developed that towns are sometimes not sure what they can do in their situation, and by bringing STP and its partners to an event and place, some of the opportunities can be explored locally and some of the myths and barriers removed. So, last Tuesday in the very interesting setting of the Mac Arts Centre in Galashiels (a converted Church) various groups from across towns in the Borders came to participate in a discussion about towns and how to make things happen in towns. The agenda is available here. The morning was given over broadly to the topic of Understanding Scottish Places. The scene was set initially in three ways. First, the local tapestry of towns was described and set out; secondly STP was described and its role explained and thirdly the Scottish Government described the key elements of the Town Centre Action Plan and the work done so far. This was followed by a description and then an interactive session involving participants looking at the detail of the USP platform. For some this was the first time they had come across USP, but for others this was a tool that was already being used in the day to day work of local authorities and others. The partners in USP (Carnegie, CLES, Scottish Government, University of Stirling and STP) are keen to understand how it is being used and what developments in a any future version would make it more useful. If you have not used it then please try it out (www.usp.scot) and provide us with feedback on its strengths and weaknesses and on possible data sets (remembering that the data has to be consistent across all 479 towns in Scotland) that might be available or should be collected. The overheads used in the presentation on Understanding Scottish Places by myself, Neil McIlroy, CLES and Jim Metcalfe, Carnegie UK Trust are available for download here. (note 8Mb). Even for those who knew the landscape and the roles played, this provided a fresh perspective on what might be possible and what these bodies can actually do. For those coming new to trying to help their towns, this certainly provided much food for thought and discussion. At the outset of the day, the point was well made that whilst we can talk about towns in the abstract (or in the 479), the reality is that each town is distinct and different. They each have roles to play and we need to better understand these roles, strengths and weaknesses. This is the aim of USP; to provide a way in to understanding your town and its relationships with other towns and its similarities and differences to local and far flung places in Scotland. Understanding yourself is vital as the first step. But one thing the platform should not be used for is to seek to make all towns the same. This is not about saying one size or shape fits all and we all need to aspire to some ideal model town. This is about understanding what is and what can be, at the local town level and then taking the right approach for that town from the community upwards. If the local players understand their place, the good and the bad, they have a better chance of finding the best approach or tool to make the most of their town. A BID is not for all; but might be right for many, but how do we start the process? Community assets and shares may be right for some places – but how do we go about it? How can we best engage the local community in formal and informal planning for a place? How can we make a town more active and accessible? The roadshow is an attempt to demystify some of the issues, make people think about their place, become aware of the tools and resources that are now available and to encourage them to start the work of making things happen in their (and our) town. And it’s coming to a place near you in the next few months. This entry was posted in BIDS, Charrettes, Community, Development Trusts, Places, Regeneration, Relationships, Scotland's Town and High Streets, Scotland's Towns Partnership, Scottish Government, Town Centre Action Plan, Town Centres, Towns, Towns Typology, Understanding Scottish Places and tagged Business Improvement Districts, Charrettes, Community, Engagement, Scotland's Town Centres, Scotland's Towns Partnership, towns, Understanding Scottish Places. Bookmark the permalink.